This is why I love Innocent drinks. I thought they were gtting a little safe and predictable with the way they were managing their brand and then out of nowhere they produce a belter like this. It’s a special guest smoothie and contains Lemons, Honey and Ginger. You can see more about it here. It also helps that it is lovely (even though I wasn’t sure and only actually bought it for the bees and seeds! But what makes it stand out is the little yellow pack attached to the top of the bottle. 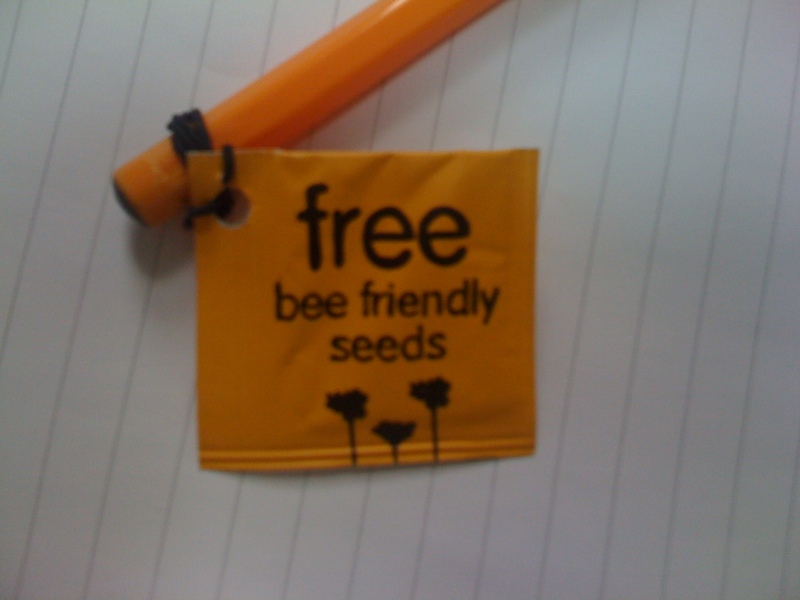 It’s seeds to allow you to grow flowers that bees like. The copy on the reverse is just brilliant too. Dead simple, friendly and enticing. Sorry, i’m looking like a bee stalker here. Bees like flowers, so why not grow your own? I like it so much, I stuck it on my favourite Bic pen. And this is where Innocent start to do things really well. They’ve set up a little micro site to get us interested in bees again. Click through here and enjoy, all you bee spotting dudes. I’m off to plant mine right away. Next Next post: The end of the design and advertising industry in the UK – or the beginning?